Guess what’s today? It’s Free Pattern Friyay today and I’m bringing you another free pattern for your collection. 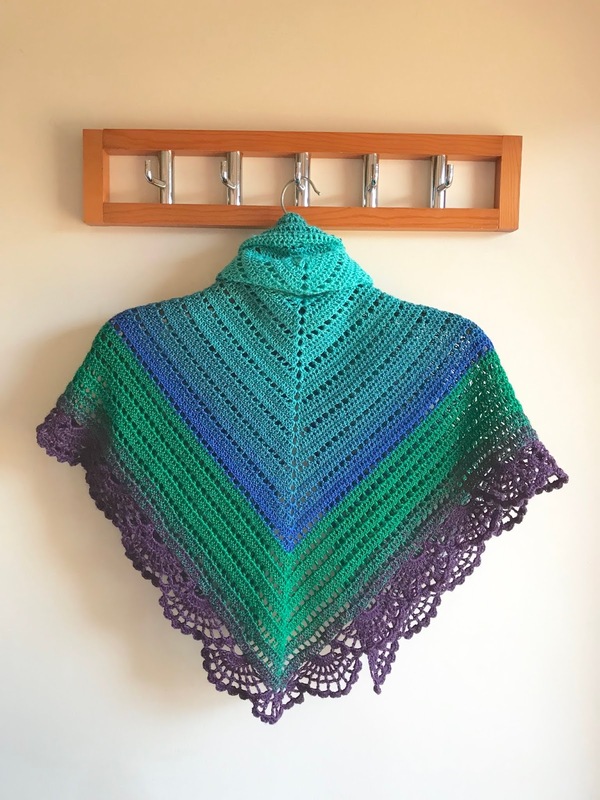 This time it’s a shawl pattern that I have been working on and I must admit the process wasn’t easy as I made some wrong colour choices which just destroyed the design but it all worked out in the end. I had a custom yarn cake made by Katherine from Quaint Craft Corner, you can find her Etsy shop HERE. I used 3-ply yarn cake which was 160 grams @ 800 m long. You can also search for a few alternatives online, I found Rico Degrade Yarn cake would work as a suitable alternative. The shawl has a slightly different construction. You start working a triangle motif working around all three sides, then you work the border around 2 sides to increase the finished width. I had this idea of a different construction in my head for a while. 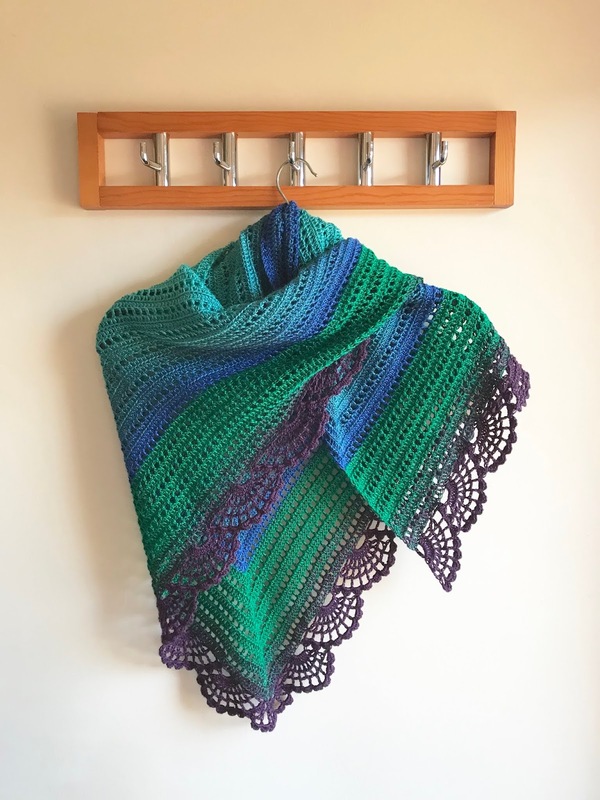 The yarn colours then inspired me to add a feather like border onto the shawl as they reminded me of a peacock. 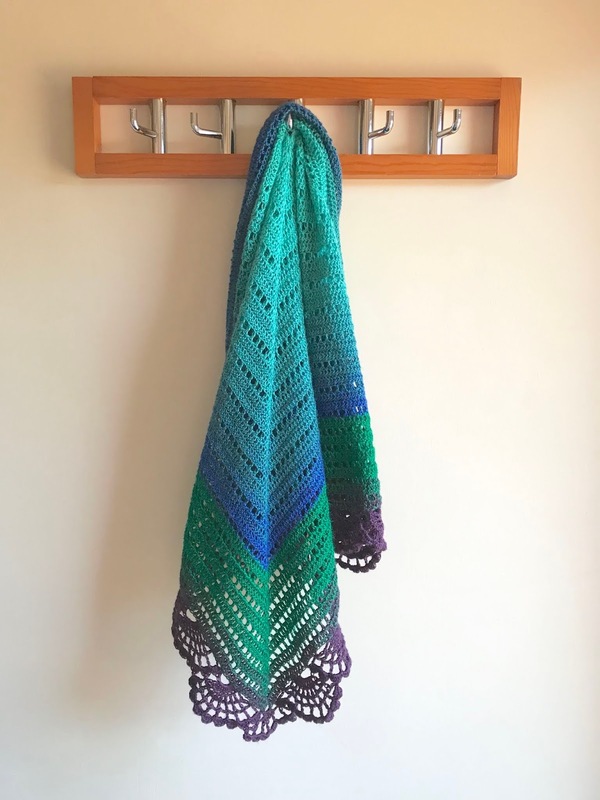 I have found this gorgeous crochet edging on Pinterest by Nilza a De Souza Crochet and instantly fell in love with it. I’ve been searching the internet for hours to get to the original website where the pattern was posted but had no luck. You can see Nilza a De Souza Crochet YouTube channel HERE. 21 tr worked over 12 rows measures 10 cm square using 4 mm crochet hook or size needed to obtain gauge. The shawl starts with triangle motif worked into magic circle. 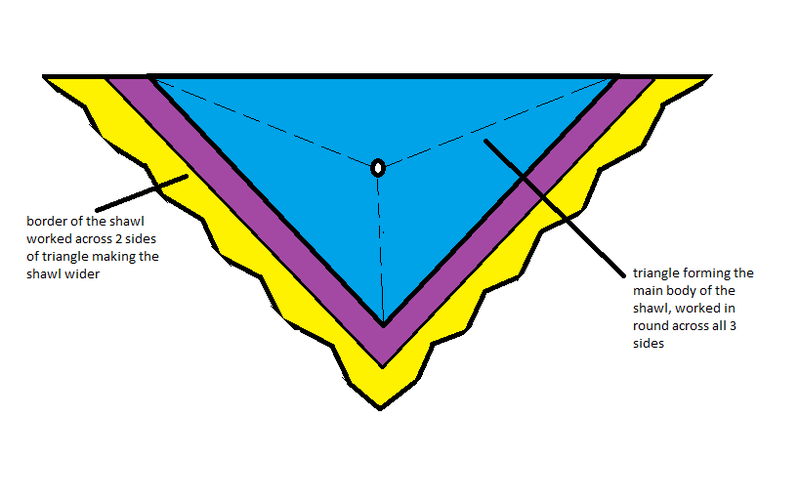 The triangle forms main body of the shawl. 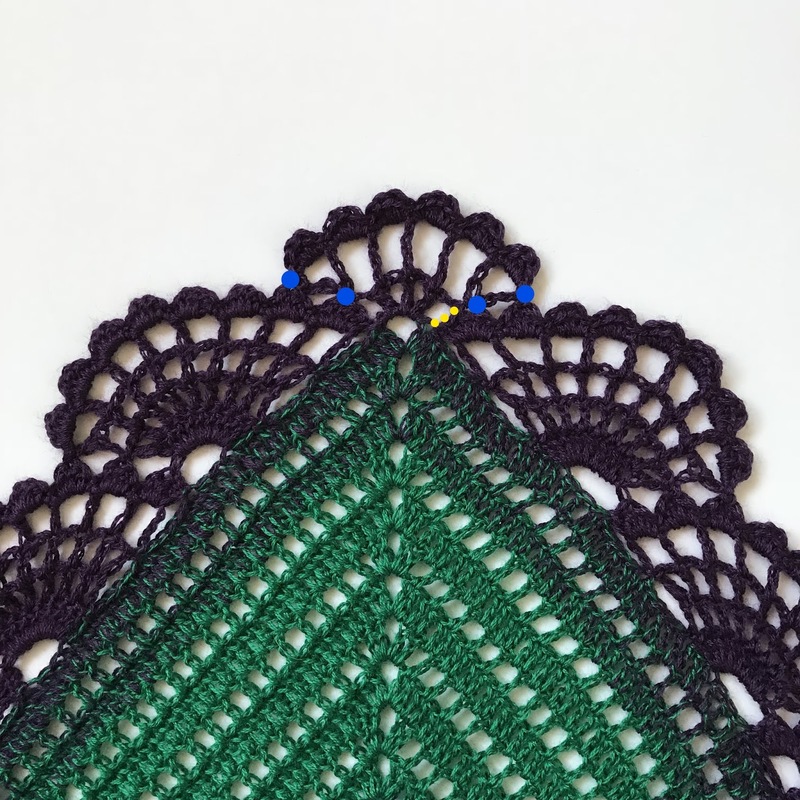 The border is then worked across the 2 sides of the triangle leaving the 3rd side unworked which makes the triangle wider on 2 sides and creates a lovely triangular shawl shape. It uses rows of treble crochet and rows of 1 tr and 1 ch-sp. 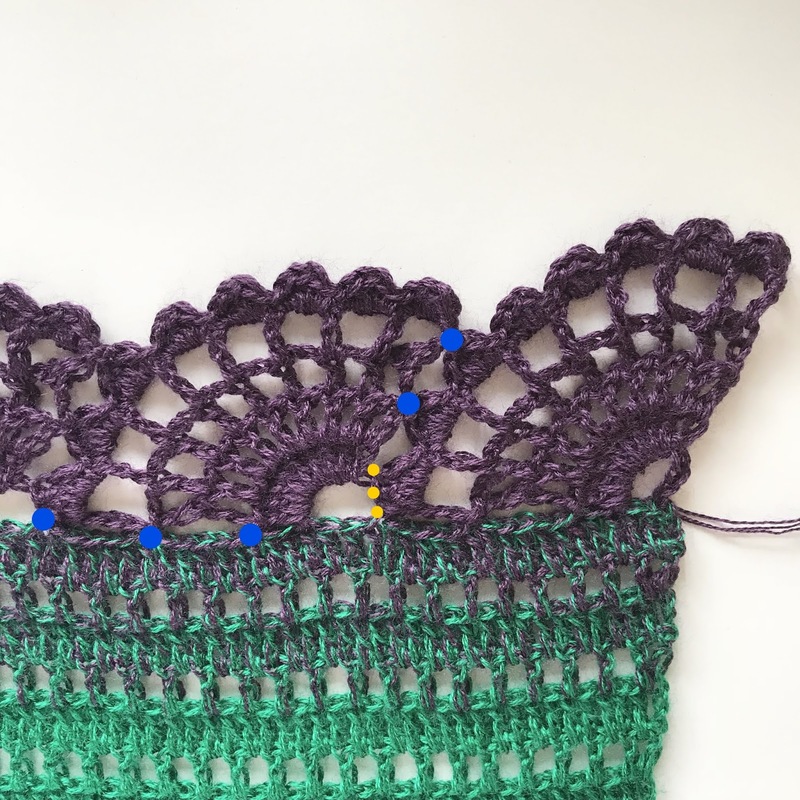 The ch-sp in lacy rows counts as 1 st throughout the pattern. Start pattern by creating a magic circle. Repeat Rnd 7- Rnd 9 for pattern 7 more times. Fasten off. Join yarn in any corner 3 ch-sp. Repeat Row 2 & Row 3 for pattern 4 more times. Do not fasten off, cont pattern with border. The border consists of small quarter circles worked straight onto the shawl in 5 rows. Set Up Loop: 3 ch, miss the st at the bottom of 3 ch and next st, 1 dtr in next, do not turn, sl st into the loop just created. Row 2: 4 ch (counts as 1 tr + 1 ch-sp), *1 tr in next, 1 ch; rep from * 7 times, 1 tr in last st, turn. Row 3: 5 ch (counts as 1 tr + 2 ch-sp), *1 tr in next tr, 2 ch; rep from * 7 times, 1 tr into top of beg 3 ch, miss 5 sts from main row, sl st in next, turn. Row 4: 6 ch (counts as 1 tr + 3 ch-sp), *1 tr in next tr, 3 ch; rep from * 7 times, 1 tr into 3rd ch of beg 5 ch, turn. Row 5: sl st into 1st 3 ch-sp, *(1 dc, 3 tr, 1 dc) in 3 ch-sp; rep from * across, miss 5 sts from main row, sl st in next, turn. Set Up Loop: working into the sts of the shell created in Row 5 of the previous motif, 3 sl st into middle tr, turn, miss 2 sts from main row, 1 dtr into next st, do not turn, sl st into the loop just created. Row 2: 4 ch (counts as 1 tr + 1 ch-sp), *1 tr in next, 1 ch; rep from * 7 times, 1 tr in last st, sl st into middle tr of 2nd shell of previous motif, turn. Row 3: 5 ch (counts as 1 tr + 2 ch-sp), *1 tr in next tr, 2 ch; rep from * 7 times, 1 tr into top of beg 3 ch, miss 5 sts from main row, sl st in next, turn. Row 4: 6 ch (counts as 1 tr + 3 ch-sp), *1 tr in next tr, 3 ch; rep from * 7 times, 1 tr into 3rd ch of beg 5 ch, sl st into middle tr of 3rd shell of previous motif, turn. Repeat pattern for 2nd motif 8 more time across the one side. Fasten off. Join yarn in the top corner on the other side and repeat pattern. Do not fasten off. Row 1: working into the sts of the last shell created in Row 5 of the previous motif, 3 sl st into middle tr, turn, working into 3 ch-sp at the bottom point of the shawl (2 ch, 1 tr) 3 times, 2 ch, sl st into middle tr of the shell of last motif on the other side, turn. Row 2: 7 ch (counts as 1 dtr + 3 ch), 1 dtr in same stitch at the bottom of 7 ch, (3 ch, 1 dtr in next tr) 3 times, 3 ch, 1 dtr in middle tr of last shell worked into, 3 ch, 1 dtr in same st, sl st into middle tr of next shell, turn. Row 3: sl st into 1st 3 ch-sp, (1 dc, 3 tr, 1 dc) into each 3 ch-sp, sl st into middle tr of 2nd shell. Fasten off, sew in all ends and firmly block to dimensions. 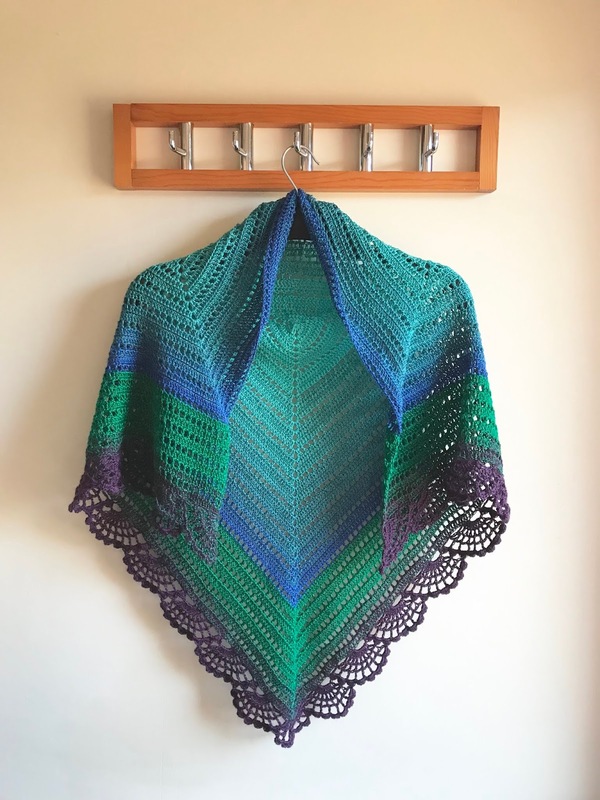 I hope you enjoy the pattern and if you do decide to make one, I’d love to see the finished shawls. You can share your finished makes over on Instagram and tag @bluestarcrochet.